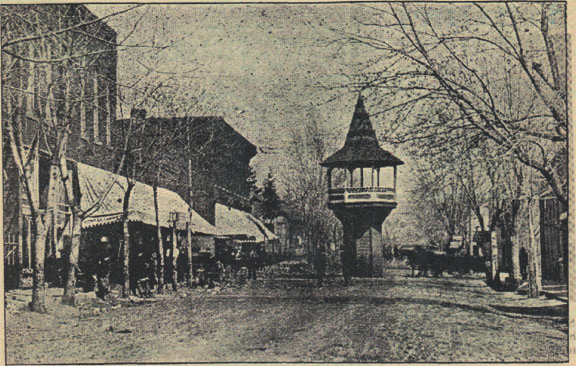 In the May 29, 1902 edition of The Edgerton Journal newspaper, Edgerton is headlined as "Platte County's Banner Town," with many fine businesses, bustling with industrious citizens. Journal publisher and editor Rev. J.C. Hubbard wrote: ". . . it is of Edgerton - the best town in Platte County, we would write. Located in the midst of a fine rich county, in a high state of cultivation, as well as in the midst of an intelligent and enterprising people, this city from its very beginning was destined to be one of the most important towns of the Platte Purchase." For your enjoyment, we have included several photographs that tell some of Edgerton's history, as well as information taken from public records. The current city officials make no warranty as to the accuracy of the information, but it does make for interesting reading. Click on the links below to take a walk down Memory Lane, Edgerton, Missouri. Above: A street scene looking east, believed to be the present Frank Street, which runs through the middle of downtown Edgerton. Reprinted from The Edgerton Journal, circa 1902.